If you’ve spent any length of time on the previous titles in the Mario Tennis franchise, you’ll quickly notice a variety of improvements right off the bat - or I suppose off the racket in this case. Nintendo’s latest installment of the long running sports franchise, Mario Tennis Aces on the Nintendo Switch shows that a series can be redeemed even when coming off a dud. Perhaps this bodes well for the next mainline Metroid game? Wii U’s Mario Tennis Ultra Smash was a mixed bag at best, chock full of odd gimmicks and slim on content. Its successor on the Switch, in comparison, dials back the more chaotic and “non tennis” elements and instead lets the basic fundamentals of sport take center stage, while fleshing things out a bit more. 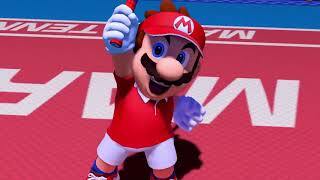 This isn’t to say that we’re dealing with Nintendo’s version of Virtua Tennis with a Mario overlay, however. The game is still very arcadey with plenty off-the-wall, party game attributes to spruce things up. Oh, and we’ve also got a decent online mode, along with a true single player campaign this time! There’s even a “swing mode” for those who live and die by Wii-style motion controls, though it comes with a lack of precision and a learning curve that I wasn’t crazy about. But I digress. The newest, and perhaps oddest new inclusion in Aces is the ability to break your opponent’s racket - and likewise to have your own inconveniently broken, Breath of the Wild style. This provides some interesting new dynamics and adds another element of challenge to deal with in the heat of the action. You’ll often be granted multiple rackets, but should you have the misfortune of breaking them all, it’s game over. This mechanic is an admirable attempt to shake things up, though it tended to provide more headaches than enjoyment. Still, it adds a subtle layer of strategy some might appreciate. A racket can break when a player fails to block a “zone shot” in the tiny window of time they’re given, which triggers upon tapping the R button over a star marker that appears on the court. You’ll be given a short window of time to aim with the gyroscope - which works surprisingly well - and whack the ball with ferocity anywhere on the court. These new super-spike shots are quite satisfying to pull off successfully, and are one of many handy tools in your arsenal to tip the match in your favor. Like many of the more impactful actions in the game, these run off of an energy gauge. You can fill up this gauge primarily by either smacking enough charge shots or showing off by flying around the court with trick shots. These stylish returns are basically a fancy, speedy way to scamper to a ball otherwise unreachable. You can also slow down time to achieve this same goal, which slowly whittles down your energy. The main attraction, though, would have to be the super-powered special move you obtain once you’ve filled your meter. Sort of a zone shot on steroids, these moves prompt a specialized, over-the-top animation which then give way for a massively powerful, lightning quick shot. These are near impossible to return without busting a racket unless you counter by slowing time or happen to nail a miraculously timed return. Of course, you can hit a ball in a number of ways with simple button pushes, including a slice, topspin hit, or a lob. The palette of attacks and defensive moves at your disposal in Aces seems subtle in comparison to Ultra Smash - but when strung together enough by players that know what they’re doing? They can make for quite the chaotic battle. It’s all pretty cleverly interwoven together, and mostly revolves around your energy meter as the common denominator. This reworking of the mechanics provides a relatively deep template that is simple to gasp. They also do well in allowing for more balanced and competitive games overall than the crazy button combos and mega mushrooms that littered Ultra Smash. With all this said, the constant Houdini trick moves, charge shots, and specials can still tend to dominate the game a bit much with those who really know how to milk them. One-sided affairs can be difficult to overcome, as momentum is hard to wrestle back from a player that keeps stacking on their energy meter. Luckily, you can switch off these added bells and whistles if you’re looking for that more gritty, stripped down version of Mario Tennis more akin to the 64 entry. You can choose to play brief bracket-style tournaments - either online or locally against bots - and can thankfully opt to play with either the stripped-down style or with the madness of power-ups and abilities. An online points system, along with a few unlockable characters promised in future tourney events, creates some incentive to mess around here. During my few hours playing online, I often received a humble shellacking from those who have clearly spent more time perfecting the art of the trick and zone shots than I had. Yet, I was typically more successful in notching victories and rank points when doing away with the gimmicks. I suppose I’m just old school that way. You can also play online with friends this time around with relative ease - another welcome addition that Ultra Smash was oddly missing. The connectivity and overall experience online have been noticeably improved as well, as I was usually matched up and thrown into a game promptly. While my connection was typically smooth when docked and near my router, it should be noted that I occasionally experienced a bit of lag stutter when playing in handheld mode farther away. This may have been the fault of my internet connection, though. Of course, there is local multiplayer component as well, which is where the goofy, rapid-fire fun of this game truly flourishes. This was especially true when playing doubles tennis with 3 other players, as it made for some exciting and chaotic showdowns, complete with plenty of highlights, blunders, and laughs along the way. As is the case in Tournament Mode, there isn’t a ton of customization here, and the level selection and number of rounds in particular are limiting. There are only a handful of stages as is, and while some are entertaining and pretty to look at, I could have done without the obstacles that come along with some of them. Yet, local multi is probably still the highlight of Aces, along with the new-and-improved online play. Even being fairly stripped down, there’s plenty of replay value to be had with what does exist. This is thanks in no small part to a diverse lineup of colorful characters - each with their own dynamics and specialties. I’m partial to the beast that is Chain Chomp when I’m in the mood to throw down and overpower my opponents, though Luigi’s proven to be my go-to for a dependable, versatile player. In addition to a solo torney mode - which is over all to quickly thanks to some pushover AI during most of it - you’re also thankfully given a story mode this time. As you’d expect, the story itself is forgettable, bloated with pointless dialogue exchanges and clichés merely acting as an excuse to continue trekking across the overworld. This campaign took me merely a handful of hours to burn through, even when losing stages at times and having to restart at various points. This mode typically contains one-on-one tennis matches, usually taking place within the hazard-laden courts which you then unlock upon completion, along with specialized rackets with unique stats. These courts include a grassy stage where piranhas pop out of pipes along the net, a Boo-themed court where the ball spits randomly out of floating mirrors if you hit them, and a Bowser dungeon stage crawling with explosive Mecha Koopas. You also get a number of minigames sprinkled about, often set along sideroads on the map, which usually aid you in honing your tennis game. You might have to take out a few Hammer Brothers setting camp on a bunch of pipes before time expires, for instance. Finally, you’ll also have occasional boss-fights, which are hit and miss, though they do come with some clever patterns and behaviors that force you to take them out in creative ways. I was surprised to see what looked to be the Master Hands from Smash Brothers make a cool cameo appearance. Overall the story mode was fairly pedestrian, and came off as somewhat rushed with how brief and limiting it was. Earning more powerful rackets, XP and stats are neat inclusions that provide a touch of RPG-influenced depth, but these factors didn’t seem to make much of an impact throughout. Still, it’s at least commendable that Nintendo included any sort of single-player focused campaign this time around. My nostalgia for the N64 version aside, Aces just may be the definitive version of Mario Tennis as it stands, if only for the enjoyable local multiplayer and mostly solid online mode. All of this is laced with some surprisingly pretty and vibrant visuals, and strengthened by a template of fun and satisfying mechanics. The solo campaign won’t light the world on fire, and the game could have perhaps done with more unlockables or customizations, but these areas are mostly forgivable. A wide variety of environments provides unique visuals that are both pretty and vibrant. Each player adds their own flair and character with some amusing voice acting bits, as do some rich and upbeat melodies. The revamped mechanics provide plenty of action that all flows nicely and works well as a balanced, yet diverse system with zone, trick, and special shots - all of which are fun to pull off. The gameplay is easy to jump into while containing enough complexity to keep things interesting. The campaign is a decent way to learn the ropes while killing a few hours and unlocking a few courts along the way, though it doesn’t achieve much more than that. It does offer a variety of creative missions that can provide doses of fun though. 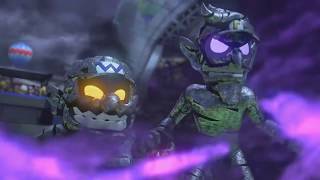 Both the online and local multiplayer are the core of Aces' appeal and longevity, and while they’re not terribly robust, they offer enough fun and solid gameplay to stand strong on their own. The online experience is greatly improved from Ultra Smash. Overall everything ran smoothly, though I did get the occasional stutter from playing online in handheld mode. 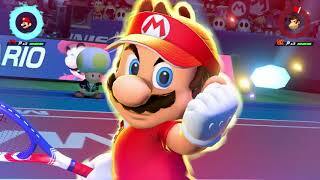 Mario Tennis Aces is ultimately a solid party game whose weak spots mainly lie in the peripheral areas like the campaign, swing mode, and fairly limited customization. The core gameplay is enjoyable and takes center stage in the addictive, fun multiplayer modes.